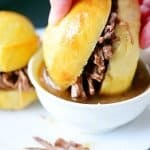 This Slow Cooker French Dip Sandwiches recipe features chewy French rolls filled with tender juicy, shredded roast and are dipped into the pot roast au jus. Many people think of making Crock Pot recipes in the winter, but I am more of a year-round slow cooker gal. I like that my Crock Pot doesn’t heat up my house in the summer like an oven does. Things are busy in all the seasons and it’s always nice to have a delicious meal that is already cooked when dinner time rolls around. Vanessa came shopping with me when she was younger and while I was picking up a few groceries, she asked if I would make slow cooker pot roast for French Dip Sandwiches. Put a 3-4 pound roast into a 6-quart slow cooker and sprinkle it with a packet of zesty Italian dressing mix . You can rub it into the roast if you want or just use a spoon or fork to spread it around. Then, flip the roast over and sprinkle the other side with the second packet of dressing mix. Pour the beef broth in around the roast, put the cover on and cook it on low for 6-8 hours, or until tender. Use two forks to shred the roast. Toast the French dinner rolls in the oven, cut them in half and fill with the shredded roast. Every slow cooker is different so cooking times will vary. If you can’t find the zesty Italian dressing mix, use the original Italian dressing mix instead. Add sliced onions and mushrooms if your family likes them on sandwiches. If you like the juice that you dip the sandwiches in thicker, follow the recipe in THIS POST for making pot roast gravy. If you don’t have enough juice left in the slow cooker for dipping, make a packet of gravy or au jus or warm up some beef broth. Top the sandwiches with slices of cheese for an extra special sandwich. Divide the juice or pot roast drippings from the slow cooker into small bowls. Dip the French dip sandwiches into the drippings. 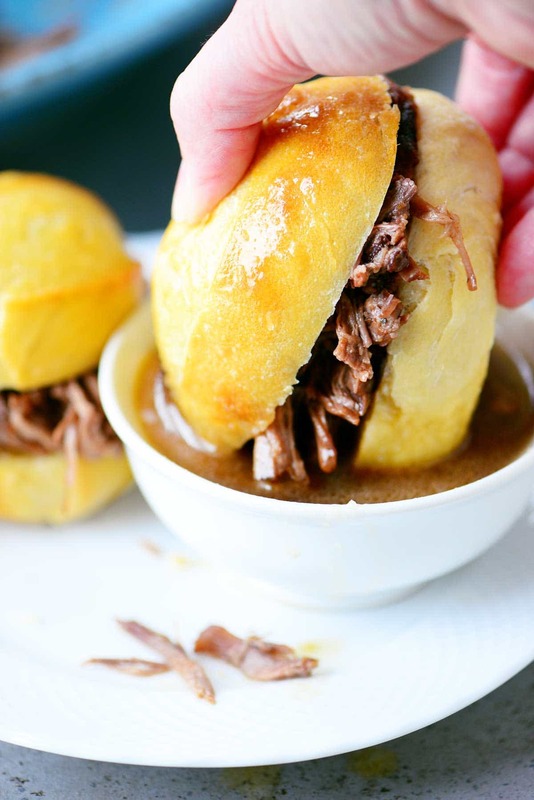 These Slow Cooker French Dip sandwiches have chewy French rolls fill with tender, juicy shredded beef and are amazing when dipped into the pot roast au jus dip! 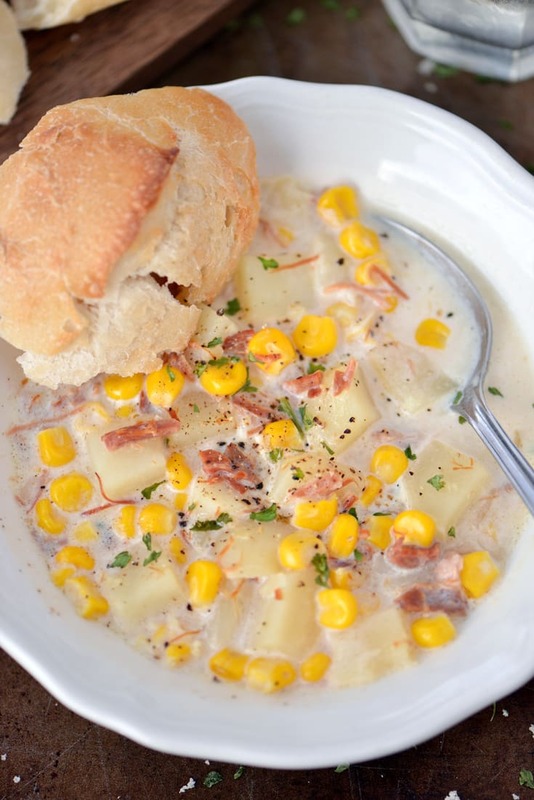 This has been one of our favorite family recipe for many, many years. Put the roast in a 6-quart slow cooker. Sprinkle with one packet of zesty Italian dressing mix. Flip the roast over and sprinkle the other side with the second packet of dressing mix. Pour the beef broth in around the roast. Cover and cook on low for 6-8 hours, or until tender. Shred the roast with two forks. Toast the French dinner rolls in the oven, cut them in half and fill with the shredded roast. 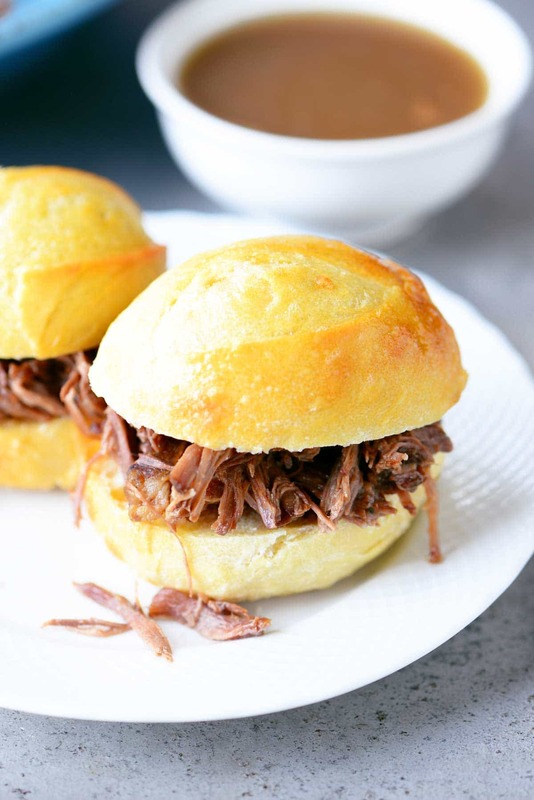 Divide the juice from the slow cooker into small bowls and dip the sandwiches in the pot roast au jus. Remember slow cookers vary so your cooking time may vary. See blog post for additional tips and ideas. Updated from the original recipe published June 2013. I saw your recipe yesterday afternoon and tried it out. Put my roast in the crock pot at 6:00 last night and rubbed 2 packets of the grocery store brand ( I’m a cheapskate) Italian Dressing mix on the meat as directed, and 2 cups of water. I thought I had bouillon cubes in the cupboard, but I guess they ran away… No broth either, so I just decided that I’d rely on the meat to make it’s own with the water I added. I cooked mine on high for 2 hours and then shifted to low until 9:30 the next morning. When I took the lid off and stuck the forks in to tear the roast apart, it was so tender! Plus the taste was amazing! My family will love these sandwiches with provolone cheese tonight! Thanks for the recipe! I’m going to try this recipe as it sounds delicious. One question I have; in the ingredient list it calls for 1 C beef broth. Is this just in case there isn’t enough au jus from the roast for dipping? I didn’t see that I was supposed to add it to the crock pot during cooking. Sorry I wasn’t very clear in my instructions. I added the beef broth before I started cooking the roast. You can cook your roast without it but I’ve always added at least 1/4 of liquid to my slow cooker when making roasts to make sure it doesn’t dry out. I thought the Au Jus was the gravy left in the pot after the roast cooked! That is the best there is! What is the Italian Seasoning Packet that you use? Is it the Italian salad dressing packets? Thank you for the idea. It sounds delicious! Are you sure about cooking it on High for 6-8hrs? Don’t you mean on Low for 6-8hrs? Cooking it on high for that long will certainly over cook it and not to mention probably ruin your crockpot. Thanks for stopping by! Yes, that is how I cook it. How do you make your roast in a slow cooker? Low for 6-8 hours? I would love to hear what you add to if for flavoring. I’m making beef French dips which I have never done. I’ve always used pork. What do you recommend when I have 5 hours before dinner time? And using the crock pot..
Meat like you would use for roast needs to cook slowly for a long period of time so that it can soften. They are often tougher cuts of meat. I’m not sure how you could speed up the process. You could try cutting the meat into smaller pieces and cook it on high but I’m not sure of the results you will get. It is roast beef but this same technique also works with pork roast if you prefer that. This is amazing:) Love it! Roast in the slow cooker is my absolute FAVE!! Sounds fantastic on the sandwiches, Tonia!! Oh wow this looks so good my mouth is watering lol thank u for sharing I know what’s for dinner tomorrow 🙂 Love crockpot cooking. Yay!! I love French dip and never knew how to make it!!! Thanks for the recipe!! I also LOVE using my slow cooker in the summertime! These look fantastic Tonia! Great minds Tonia. I like to use my slow cooker in summer too although I’m firing up the oven more now to heat the house up in the evenings! 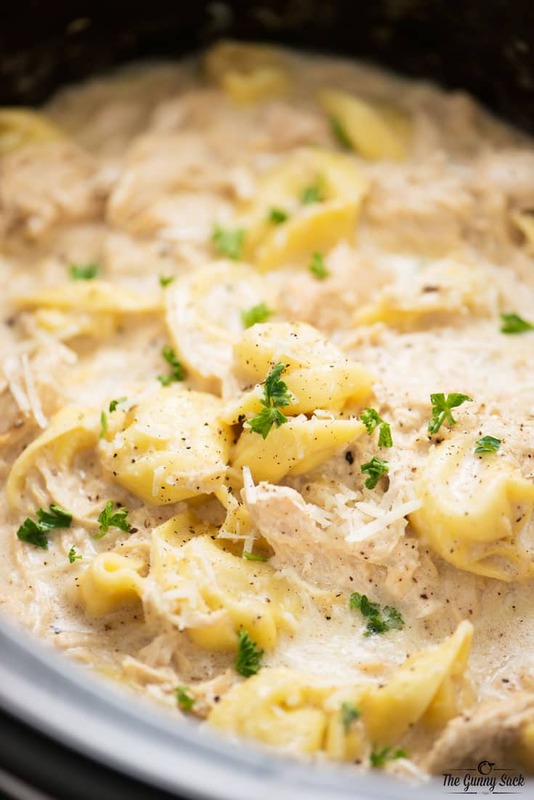 GREAT slowcooker meal. The slowcooker is my very best friend. Thank Jane! Nothing like a BFF that is always there for you and makes your life easier, right? Two of my kids are teens and they will ONLY eat beef if it’s in a French Dip! (Lucky we all like them!). 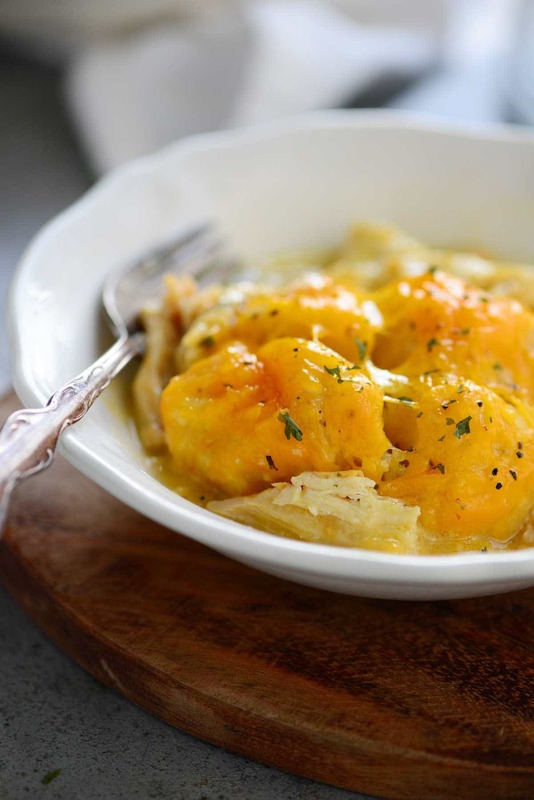 I usually use leftover roast, but this is a great idea to use the crock pot. Plus, the crockpot is great for summer. Especially on rainy hot days when you have to use the kitchen. I will pin this! Thank you! Thank Jules! I hope they enjoy it! Isn’t it amazing how much food teens can consume? I love using my slow cooker in the summer. It keeps the house so much cooler but still provides a delicious meal. These sandwiches look so good! I need to use my slow cooker more and had not thought about it for Summer but you’re right. Perfect for hot days and not heating up the house. These look fabulous! Thanks Carol! I agree! I need to use mine more too! 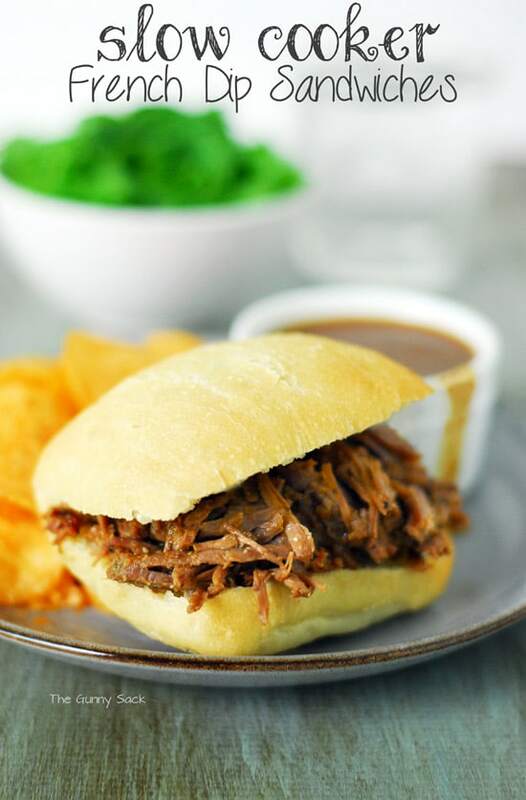 I like to take slow cooker pot roast and pile it in a kaiser roll or sub sandwich roll add cheddar cheese, wrap it it foil and bake it till the cheese is all melty and thr roll is nice and crispy on the outside, it is delicious, and my family really love it this way! Oh Norma…that sounds amazing! Thanks for the great idea. I’ve got to give it a try! 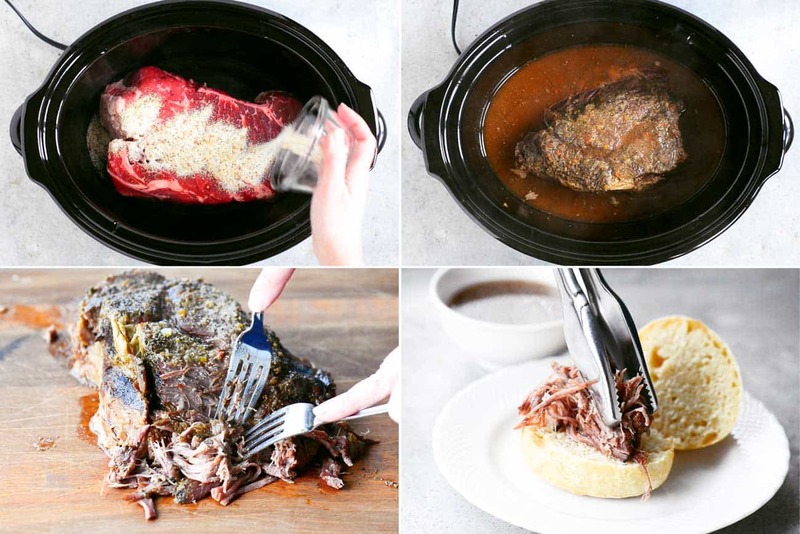 I have to show this recipe to my daughter as she loves Roast Beef & she likes using her slow cooker when ever possible..
Plus it does look real good. Thanks Anna! I hope she tries it out! Those look really good! I love my slow cooker but I don’t use my slow cooker as often as I should though. Thanks Vanessa! I know what you mean…I need to do more planning ahead so that I am more prepared!